Ni no Kuni Impressions: Presentation, Presentation, Presentation! DS title "Ni no Kuni" is not just another role-playing-game from Fukuoka-based developer Level-5, it is the first game venerated animation house Studio Ghibli has worked on. Expectations for the title are running high. At this year's Tokyo Game Show, I was able to get hands on with the title. It is Ni no Kuni, a role-playing game for the Nintendo DS and "another platform". The story follows Oliver, a young boy whose mother dies. One of his dolls turns into a fairy named Shizuku. 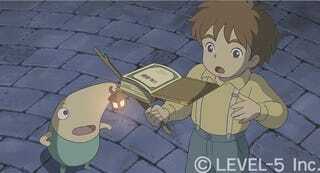 Oliver is able to go into another parallel universe called "Ni no kuni" via a book Shizuku gives him. The boy sets out to save his mother. We saw the first ten or so minutes of the game, which is mostly cutscenes, dialogue scenes and tutorial. The presentation is slick — very slick. That sound not come as a surprise since Level-5 is also responsible for the Professor Layton games. The cutscenes sparkle on the DS, and many of the dialogue scenes even have voice acting as well (not all though!). The actual small bit of game play we saw looked beautiful as well. Oliver ran through a field-type forrest. His movement is touch pen controlled as the recent Zelda DS titles have been. The game is nearing completion and due out next Spring. Hard to say as we didn't get to check out the actual combat. Level-5 only allowed short periods of play during the TGS show floor demo, and I ended up spending most of the time watching cutscenes and reading through dialogue boxes. I am interested in checking out the title's combat. This game is gorgeous and will appeal to anyone who likes Ghibli's films. Likewise, the score from renowned composer Joe Hisaishi and the top flight voice acting gives the title a sweeping, epic quality. Since the time Level-5 allotted, our hands-on unfortunately did not shed much light on to extended gameplay, but it did provide a taste of the game. We're interested to see more of this title.